This article is about the Syracuse metropolitan area and surroundings, the more westerly of two regions known as "Central New York". For the more easterly definition, the New York tourism region formerly known as Central-Leatherstocking, see Central New York Region. Under this definition, the region has a population of about 1,177,073, and includes the Syracuse metropolitan area. The total area of the above counties is 8,639 square miles (22,370 km2), which is slightly smaller than New Hampshire. The major colleges and universities in the region include Colgate University, Cornell University, SUNY Upstate Medical University, Hamilton College, Le Moyne College, SUNY Oswego, SUNY Cortland, Utica College, Ithaca College, Syracuse University the SUNY ESF, Cazenovia College, Morrisville State College, and SUNY Polytechnic Institute. Major newspapers in the region include the Oneida Daily Dispatch, Syracuse Post-Standard, Auburn Citizen, Rome Daily Sentinel, Ithaca Journal, and Utica Observer-Dispatch, as well as the alternative newsweekly Syracuse New Times. The region is served by several television stations based in Syracuse (including ABC affiliate WSYR-TV, NBC affiliate WSTM-TV, CBS affiliate WTVH, Fox affiliate WSYT and PBS member station WCNY-TV) and Utica (NBC/CBS affiliate WKTV, ABC affiliate WUTR and Fox TV affiliate WFXV). Note: Cortland County and Tompkins County are often considered part of the New York State region called the Southern Tier; the ski country demarcation line runs through Cortland County. Tompkins County, which features Ithaca at the end of Cayuga Lake, is also considered part of the Finger Lakes. Oneida County and Herkimer County are often considered part of the New York State region called the Mohawk Valley, although the "Central New York" and "Mohawk Valley" definitions overlap, and neither definition is mutually exclusive. Therefore, Tompkins County, Cortland County, Oneida County, and Herkimer County are only Central New York in the broader sense of the phrase "Central New York". 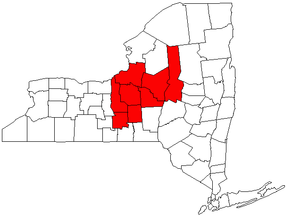 Only Onondaga County, Cayuga County, Oswego County and Madison County are always considered "Central New York". 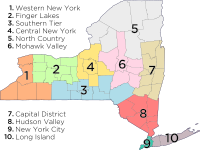 The New York State Department of Transportation's definition of the Central/Eastern region includes the counties of Albany, Broome, Chenango, Columbia, Cortland, Delaware, Fulton, Greene, Herkimer, Madison, Montgomery, Oneida, Onondaga, Oswego, Otsego, Rensselaer, Saratoga, Schenectady, Schoharie, Sullivan, Ulster, and Washington, but does not commit itself to a definition of Central New York per se. During the early historic period, the Iroquois (Haudenosaunee, Five Nations) successfully excluded Algonquian tribes from the region. The Central New York Military Tract (land reserved for soldiers of the American Revolution) was located here. Many towns derived from the tracts have classical names. Many Central New Yorkers pronounce elementary as /ɛləˈmɛntɛri/ instead of the General American pronunciations of /ɛləˈmɛntəri/ and /ɛləˈmɛntri/. The r-colored vowels in documentary and complimentary follow suit. ^ "Central/Eastern Region"[permanent dead link], New York State Dept of Transportation. Retrieved 25 January 2009. ^ Dinkin & Evanini (2009): "An Eleméntàry Linguistic Definition of Upstate New York".